Take Route 135 to Exit 9 and then proceed west on Plainview Road which quickly becomes Broadway. Make a half-right turn onto Cherry Avenue and then another half-right turn onto Stewart Avenue. Briarcliffe College will come up shortly on your left. 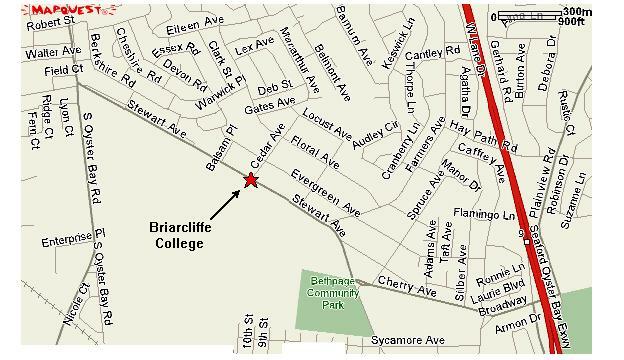 Coming from South Oyster Bay Road, proceed east on Stewart Avenue until you come to Briarcliffe College. The driveway entrance is at the eastern end of the Briarcliffe campus. Park in the student parking lot in the back of the building and go inside via the entrance which faces that parking lot. After going through two sets of glass doors, you will see a hallway which you will follow straight ahead in front of you, in the direction that leads back to the street. Walk as far as possible down that hall (without leaving the building again) until you come to the very last hallway that goes off to the left and make that left turn. Just a few steps more brings you to "The Great Room" on your right, which is the classroom where the meeting will be held.